replaced the OEM Tires on my 2015 Subaru Forester Last week as the tires were Bridgestone Dueler 400 H/L.. and they handled very poorly in wet weather... and even worse in snow.. did research on the General Altimax RT43.. and what a difference in road response... handles 100 times better in the rain... and no road noise from the tire.. also the Subaru rides a little softer now, not stiff like with the duelers... I have not driven in any snow as of yet.. but i'm sure these new tires will still handle well. Just got them installed today. Great grip on snow. You can feel great grip on wet and dry weather. Great choice. Just bought these tires; replacing Michelins. Ride just as good, handle just as good, just as good in the rain. Don't know wear yet. So far so good - great tire for the money. I'm getting ready to purchase my 3rd set of these tires on three different vehicles. Excellent tire and very reasonable price. I have recommended these tires to several people and they too have been pleased. Excellent tires. I am very happy with them. 35,000km and have not had any problems. Tires were to replace my stock Hankooks from the factory. These sound so much better and ride very nice for low budget tires. Highly recommend for cheap factory tire replacements. Excellent value for the money. Good performance. I would highly recommend. After driving in dry/wet/snow with these tires, I can say that I am satisfied with them so far. They get the job done and are at a great price. After seeing the reviews and having them recommended to me from a trusted source, I purchased 4 tires. With the snow we just got, the tires performed great. Down hills, up hills, and around curves, these tires really grip and have amazing traction compared to the OEM tires that came with the car. Thanks. Changed from the OEM Kumho Solus KH25 which were barely adequate to perform as an A.S. tire when the weather changed to wet weather or temps below 50. The new Generals are far quieter and offer great traction in all conditions. I am looking forward to seeing how they perform in the white stuff. Highly recommend. A really great tire and I am glad to feel safe for my husband who drives the car everywhere. Thank you for your excellent product. After researching thoroughly for best fit, top quality longer life tires, I found the RT43 to be the choice for my '02 Corolla CE. And where other retailers estimated 3-7 days delivery for install, this shop had them in-stock and quoted the best price over all others. Arriving early, my car was nearly immediately up on the rack being tended. Time from arrival to payment was less than 45 minutes and I was informed of front brake pads nearing end-of-life. Everyone at the shop was courteous friendly and professional. And I got a free cup of coffee as well. Tires are perfect match for my vehicle and have a sharp tread pattern for my economy car. Performance to date has been excellent. Dry Pavement Traction - Superb and sure-footed. Cornering Stability - Exceptional, has improved car's responsiveness, especially on higher speed curves. Hydroplaning Resistance - High confidence even in downpours. Feels much safer. Wet Traction - Excellent: tires grip very well. Steering Response - Response is sure and quick. For an economy car, these tires add some fun to driving. Snow/Winter Driving - Purchased at start of Spring so no experience on them yet. I expect very good traction akin to wet traction being excellent. 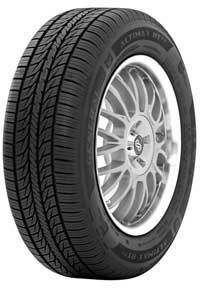 I would recommend these tires, especially for 8th Generation Corolla or Geo Prism. And from blogs and comments I've researched, I'm hoping to get a solid 4-5 years out of these depending on miles driven. And finally I highly recommend this shop for tires on price and installation. If I lived closer, I would also try out other services. Will drop by for free rotation as scheduled. Five Stars all around. These tires are a great value and have good traction, even when going uphill with only 2 of the front. These tires still grip. These are great tires. I would definitely buy again.